Sierra Reiten, of Key of Si, often jokes about having actually begun her musical endeavors while still in utero! 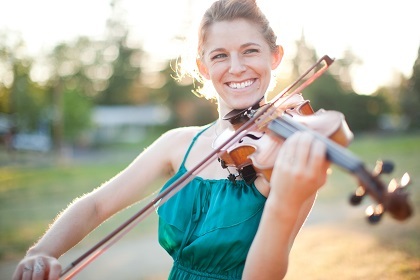 Born into a family of musicians and daughter of a loving violin teacher, Mrs. Reiten began learning to play violin as soon as she could say “violin!” Performance experiences include the Oregon Cabaret Theatre, Portland Community Music Center, Oregon Shakespeare Festival Daedalus Project, Southern Oregon University Theatre, Camelot Theatre and various freelance performances. Mrs. Reiten has dedicated her entire life studying the violin emphasized through the Suzuki Method. She has ten years experience teaching private violin and seven years teaching group classes and ensembles featuring violin, viola and cello. At Key of Si, she teaches violin, viola and preschool Kindermusik classes. She is currently the orchestra director at Madrone Trail Public Charter School and has served as a violin consultant to the South Medford High School orchestras and has taught at a variety of fiddle camps. Mrs. Reiten prepares her students for performances of all kinds, ensembles to orchestras, auditions to solos. A graduate of Oregon State University, Mrs. Reiten receives on-going training with Suzuki Specialist Kendra Law and has had extensive training with industry leaders such as Faina Podolnaya, Sherry Kloss, and Shelly Rich.